Fr. Jim was raised in Aiken, SC and was baptized and confirmed in the Episcopal Church as child. He attended Furman University in Greenville, SC and graduated with a BS in Biology in 1976. Returning to Aiken he worked for several years as research assistant at the Savannah River Ecology Lab and then at the Medical College of Georgia. He moved to Augusta, GA and changed careers, taking a job with the Golden Harvest Food Bank where he served as the Agency Coordinator and helped churches to use the Food Bank as a resource in their ministries to the needy. He married Kay Weede in 1984 and they moved to Atlanta in 1989 when Jim took a job with the Atlanta Community Food Bank as a special events fundraiser and then as the Director of Information Technology. He and Kay have three grown children and six grandchildren. 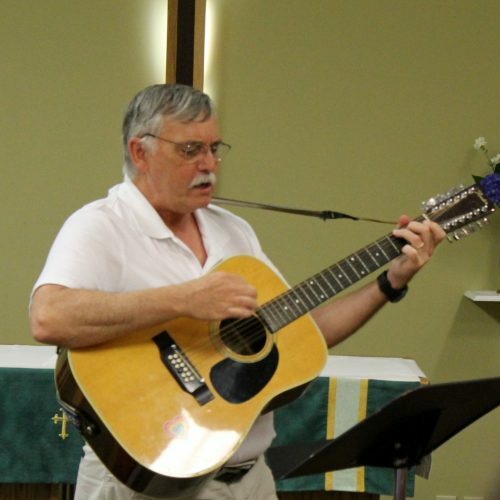 Jim has been active in the church for many years serving on the vestry, teaching Sunday school, participating in Cursillo and leading worship at prayer meetings. He worked to start Kairos Prison Ministry in the state of Georgia. In a career change, he attended Reformed Theological Seminary in Atlanta. He was ordained a deacon in the Anglican Church of North America in June of 2011. On November 3, 2012, Jim was ordained to the priesthood at the annual synod of the Anglican Diocese of the South. Fr. Jim has served as Rector of Trinity Anglican Church since March 2013. Deacon Melinda Scarborough has been a member of Trinity Anglican Church for many years. She felt a call to minister as a chaplain in the prison system. She was ordained a deacon in the Anglican Church in North America in June of 2014, and has been working with Kairos Prison Ministry, serving as a volunteer chaplain at Lee Arrendale State Prison, and as a Deacon here at Trinity.